BGC doctoral students were busy this past term and during the summer, presenting papers at conferences and representing the BGC. Doctoral student Maude Bass-Krueger presented at two conferences: the 2013 Costume Society of America National Symposium, Las Vegas, and the Association of Dress Historians New Research Day, London. In Las Vegas, her paper was entitled Travestissement and historic dress revival in 19th-century France: Fancy dress at home. In London, Bass-Krueger presented Rehabilitating Jules Quicherat’s fashion historicism: the evolution of fashion history out of antiquarian studies in 19th-century France. Meanwhile, in July, doctoral student Meredith Nelson Berry presented a paper on Reconstructing Context: Unexcavated Archaeological Objects in Early Medieval Art and Suggested Approaches at the conference “Negotiating Boundaries: Plural Fields of Art History” in Birmingham, England, at the University of Birmingham/Barber Institute of Fine Arts. Also in July, first-year doctoral student Christine Griffiths presented two papers in Britain: one at the Costume Society Symposium on Accessories in Norwich, England, and another at the British Society of Eighteenth-Century Studies (BSECS) Postgraduate and Early Career Scholars' Conference at Northumbria University in Newcastle upon Tyne, England. In Norwich, her paper was entitled “Not Forgetting his Perfumed Gloves”: Accessorizing scent in 18th-Century England. In Newcastle upon Tyne, at a conference exploring the theme of “Play,” Griffiths presented Picked Flowers and Perfume Texts: Scenting the Eighteenth-Century Kitchen. 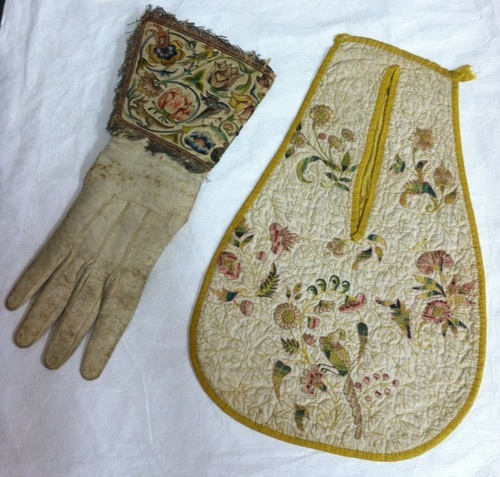 17th-Century glove and 18th-Century pocket. In England as well, Beth McMahon gave paper on Henry VIII: Unlikely Valentine to the grad students session in the English Lit department at the University of Manchester. Also at the University of Manchester, but at a different conference, Donna Bilak gave a paper at the 24th International Congress of History of Science, Technology and Medicine. Her paper was part of a symposium entitled "Reworking the History of Chemistry: Practice, Visualization and Exchange." Donna's paper was entitled The Allegorical Laboratory: Process and Technology in Michael Maier's Alchemical Emblem Book, Atalanta fugiens (1618). And coming up soon in October, Hadley Jensen will be presenting at the Native American Art Studies Association (NAASA) conference in Denver. Her panel is entitled "It's Complicated: The On and Off Relationship Between Native and American Art," and the title of her paper is Shaped by the Camera: Benjamin Wittick and the Imaging of Craft in the American Southwest, 1878-1903.